Trilogy started 2019 off in slightly different fashion, with a twist on our regular Blue’Aina. Although typically a snorkel & reef cleanup, this time we embraced our favorite season, and took our excited volunteers out for an educational Whale Watch with our well-fitting non-profit, Whale Trust Maui! For the 3rd year in a row, Blue’Aina has devoted one trip during Maui’s winter months for citizen science and education, typically focusing on the thousands of humpback whales that visit us each year to birth & raise their calves. 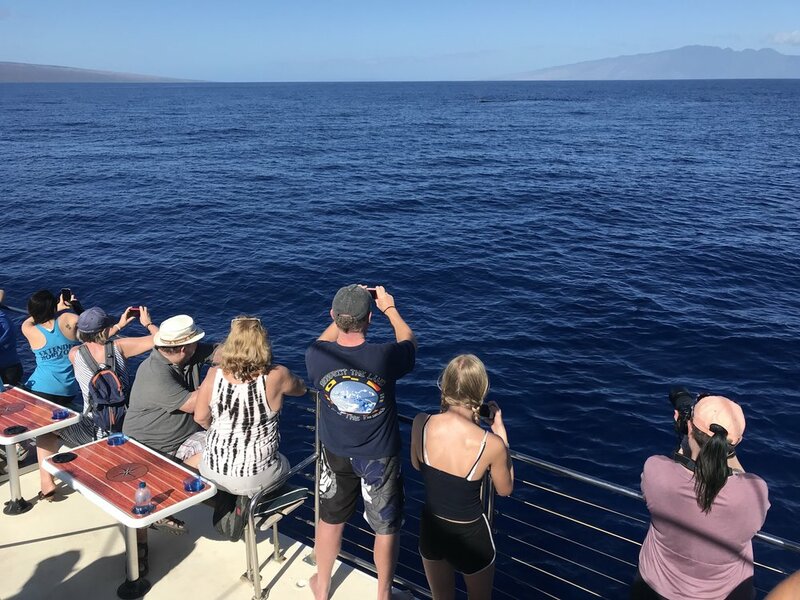 Our representatives aboard from Whale Trust Maui, including co-founder Flip Nicklin, were a perfect fit for the day’s activities, as volunteers were encouraged to ask questions and talk story directly with day-to-day humpback whale researchers. Our corporate sponsor for January, Wiki Wiki Solar and Electric, also brought along several volunteers, eager to learn more about these majestic creatures. Located on the island of Maui, Wiki Wiki is a company that believes in providing quality and friendly electrical services through their large network of talented contractors. They are also known among locals here for generously giving back to the island whenever they can. This Sunday the 6th, we were so grateful to have these outstanding organizations onboard with us! Eager to get the day started, the 56 volunteers from Whale Trust, Wiki Wiki, and Blue’Aina climbed aboard the Trilogy I, and sailed out into the channel, keeping their eyes peeled for any whale activity. And sure enough, Captain Raquel and Magen, Trilogy’s Conservation Director, had barely finished giving their safety and introduction talks when an adult humpback suddenly breached multiple times right in front of the boat! Effectively setting the tone for the day, no one was left disappointed. For the next 2 hours, we bounced around to a few different groups of whales and saw a LOT of surface activity, including pectoral fin slaps, head lunges, and breaches. 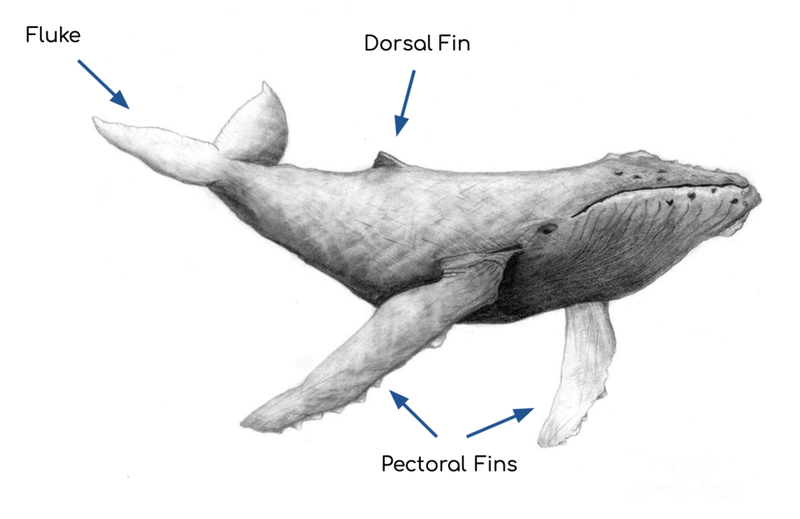 A pectoral fin slap is when the whale raises one of its side fins out of the water and slaps it on the surface. A head lunge is a competitive behavior where the whale lunges forward with its head out of the water. The holy grail of whale watching, a breach is when the whale partially or fully launches itself out of the water, doing a rotation in the air and landing in the largest cannonball splash you have ever seen! A little about our non-profit… Near and dear to our hearts, and a return non-profit recipient for Blue’Aina, Whale Trust’s mission is to promote, support, and conduct scientific research on whales and the marine environment. They believe that science lies at the heart of environmental education and conservation (could not agree more! ), and the group continuously conducts research on the whale’s song, male & female interactions, and female whale behavior in particular, as well as overseeing ongoing photo and video research. Whale Trust co-founder, Flip Nicklin is widely regarded as the premier whale photographer of the world and is an accomplished contributor to National Geographic. With more than 5,500 dives in his repertoire, he helped co-found Whale Trust Maui in 2001 with Meagan Jones and Jim Darling, all sharing the same belief that scientific research is what truly lies at the heart of meaningful marine life education and conservation programs. 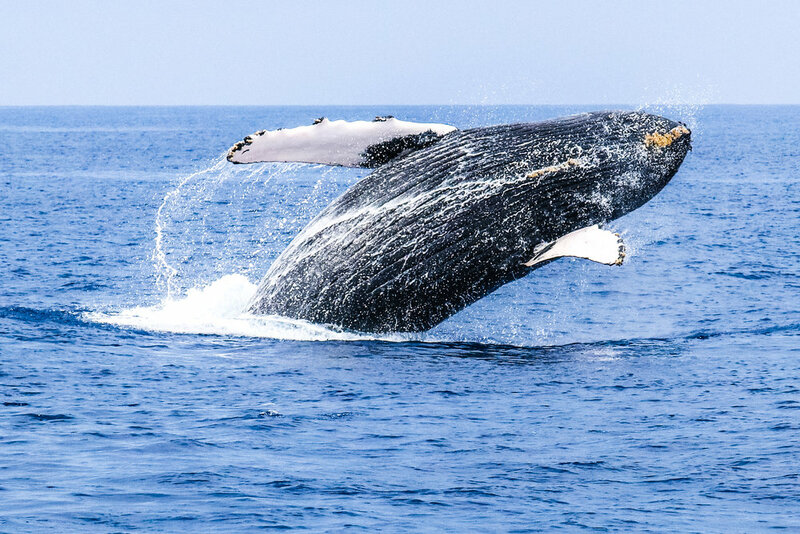 A well-known and respected part of the Maui community, Whale Trust holds an event each year for local residents and tourists alike called Whale Tales. This year’s event will take place on February 15-18 at the Ritz Carlton, and we can’t recommend it enough! In the words of the non-profit themselves, Whale Tales brings together marine experts and thousands of residents and visitors from around the world each year. Since 2006, world-renowned presenters have joined the Whale Trust research team on Maui to collaborate and share the latest findings on humpback whales and their environment. Over four days, scientists, photographers, filmmakers and conservationists join the public for a memorable weekend of engaging talks, receptions and exciting whale watches. All of us here at Trilogy look forward to whale season each year and we truly loved having our local Maui humpback whale researchers on board with us this month, for our special citizen science Blue’Aina. Trilogy runs Blue’Aina reef cleanups the first Sunday of every month, all year round, so don’t forget to check out the website for availability and featured sponsors and non-profits for 2019! Hauʻoli makahiki hou | Happy New Year!